This guide is deigned to help you get a freshly installed Windows 2008 Web Edition virtual machine to connect to the Internet. While the focus of the guide is related to virtual machines, the concepts involved also apply to fresh installs for dedicated servers as well. If you have not done so already, you should start and console the machine now. At the “Press CTRL + ALT + DELETE to log on” prompt, you will need to click the “Ctrl+Alt+Del” icon in the upper left corner of the Console window. On the “Network Connections” page, Right-click Local Area Connection, then click Properties. From the Local Area Connection Properties pop-up window, click “Internet Protocol Version 4 (TCP/IPv4) then click the Properties button. Before proceeding, you will need to obtain a static IP for the VM from ServerPortal.com. As a default, Codero Dedicated and SmartServers are initially allowed 4 IPs, however only one of these IPs is allocated to the server. This guide is designed to show you how to obtain the remaining IPs that have been reserved for your system. Scroll to the bottom of the page to Network Information. Any additional IPs (non-primary) will be displayed here. Click the Request an addition IP button. If after a few seconds you do not see the new IP listed, click the refresh button on your browser to update the current web page. Up to 4 IPs (including your Primary IP) will be assigned without question. Any additional IPs beyond 4 will require justification. It is recommended to leave the ServerPortal page open. We will return to it in a few steps to add the MAC address of the VM. Without registering the MAC Address in ServerPortal, your VM will not be able to connect to the Internet. 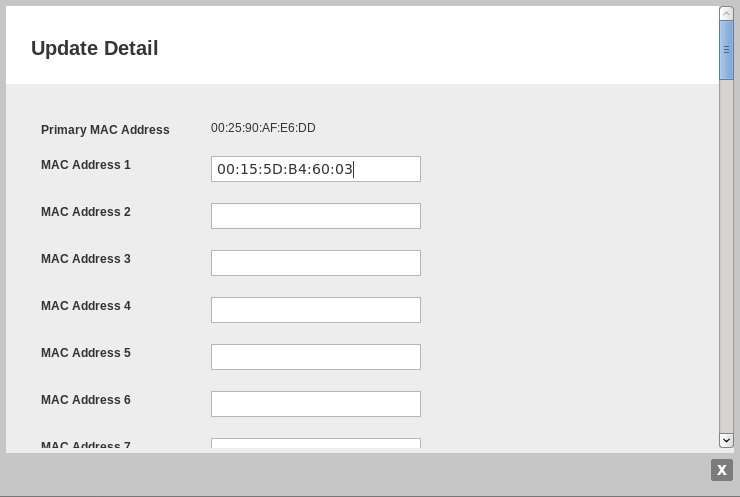 In the IP Address field, enter the IP you obtained from ServerPortal.com. To complete the network configuration, click Close on the Local Area Connection Properties window. Even when properly configured, the server will not connect to the Internet until you submit the MAC Address in ServerPortal. IMPORTANT! Windows incorrectly reports the MAC address with hyphens ‘-‘ instead of colons ‘:’. When copying the MAC Address from the Windows command line into ServerPortal,com, replace each ‘-‘ with a ‘:’. Example, in the output listed above, the address is reported as 00-15-50-B4-60-03, however, when you enter it into ServerPortal.com, you should instead enter it as 00:15:50:B4:60:03. After adding your MAC Address in ServerPortal.com, you should now be able to connect to the Internet. You can test this by pinging google.com from the command window. In order to use Remote Desktop (a.k.a. RDP or rdesktop in Linux) it will need to be enabled. Open the Server Manager by click Start then Server Manager. On the System Properties pop-up window, click the Remote tab. In the Remote Desktop section, select (*) Allow connetions from computers running any version of Remote Desktop. From this point, you can now access your VM using your chosen Remote desktop client and the IP you assigned to the server.